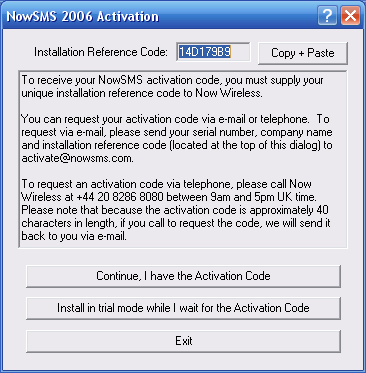 If you do not already have an Activation Code, you must run the NowSMS installation program to generate your Installation Reference Code. As the NowSMS installation continues, an informational message will be displayed to indicate how many days remain in the trial period. For a first-time installation, the informational message should indicate that 60 days remain in the trial period. 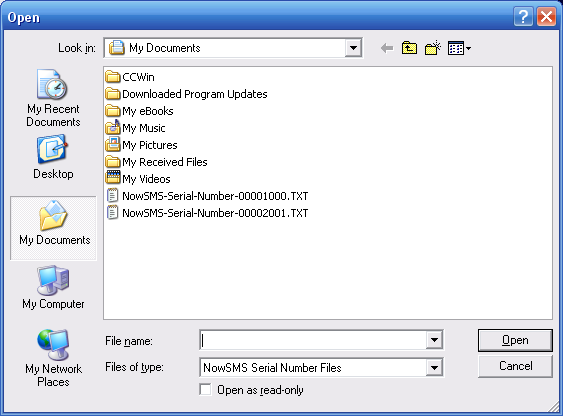 (NowSMS counts each day that the product is used.) Select OK to continue. Alternatively, if the trial period has already expired, the message may indicate this and you will be asked if you have a purchased license to install. If this message is displayed, select Yes to continue. Select “Install with a purchased serial number”, and the installation will continue. 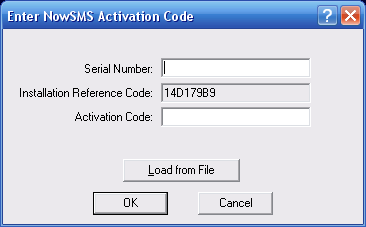 As mentioned previously, the Activation Code is approximately 40 characters in length, and can be either entered manually, or more commonly, the publisher of the NowSMS software will send you a text file attachment in an e-mail message, which can be easily selected via the Load from File button.